We noticed it just after the first of the year. The (what seems like) annual war between cable/satellite providers and local TV stations. Charter Spectrum and Tribune (among others) go at it for a few days – until one caves to a price increase for the opportunity to carry. When that channel is your favorite – you’re forced to get local news from another source. That’s when the ‘uncomfort’ level – grows. You’re not familiar with this ‘new’ stations’ presentation – anchors – logo – set look. It’s not that the news product is better or worse –just different. Generally, change in any business – creates discomfort. Remember what went down with Coca-Cola in in 1985? Many brands make wholesale changes with detrimental effects – misreading market changes. Often times a new leader arrives with an attempt to put ‘their mark’ on the brand. Without regard to market legacy. Logo – aural presentation – talent – all matter to the end user. When considering changes for your brand know – even the smallest changes will take time to print. Especially talent. Talent – does matter. In today’s multi-screen – multi-platform world – talent is most often the BIG differentiator. Especially morning product – where people have a set routine. Change? Expect a new morning brand – radio and screen – to fully peak six to eight measurement seasons in. People just don’t change their routines unless the current product is a repellant. Finally – consider the brand – Bar Keepers Friend. Initially sold to bar owners in Indianapolis – in 1882. Available to the general public for decades – the cheap, white powder still gets rave reviews today. Original formula – Original logo (swinging saloon doors). For three centuries – even through Prohibition when ‘bars’ were shuttered. There’s an advantage to incumbency. Next Week: What do you need? Kevin Robinson is a record-setting and award-winning programmer. His brands consistently perform in the Top 3 of the target – often times as the list leader. In his 35 years of radio, he’s successfully programmed or consulted nearly every English language radio brand. Known largely as a trusted talent coach, he’s the only personality mentor who’s coached three different morning shows on three different stations in the same major market to the #1 position. His efforts have been recognized by The World Wide Radio Summit Radio & Records, NAB’s Marconi, Radio Ink and has coached CMA, ACM and Marconi winning talent. He is also a featured speaker to national groups and state associations. Kevin lives in Indiana with his wife of 33 years, Monica. 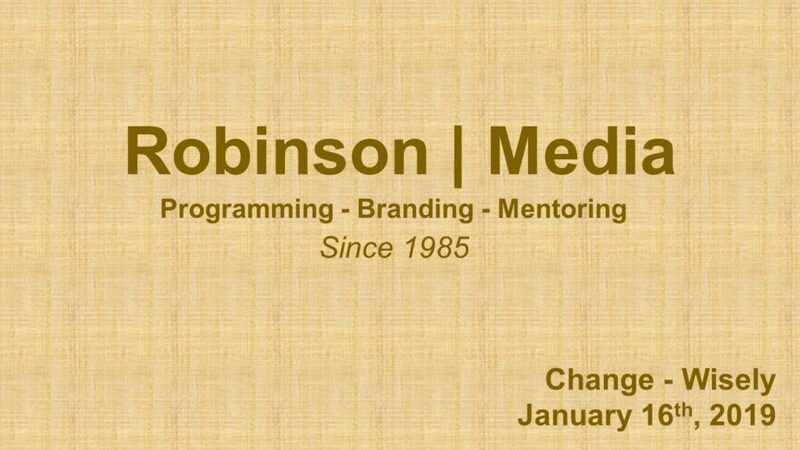 Reach Kevin at (317) 769-0583 or kevin@robinsonmedia.fm.